Taking the first step can be daunting. As an Emotional Health Coach, I can help you take those first steps (and many more) to reach your goals. Helping you find your inner spark, your motivation that will keep you going. Helping you explore who you really are, who you want to be, help you gain focus & walk beside you every step of your journey towards your destination. I incorporate stress management techniques and use EFT – Emotional Freedom Technique / Tapping into our sessions, to help you de-stress, release blocked emotions that are holding you back and increase your energy and motivation. I address any dietary issues and give nutritional advice if requested. Two very powerful emotions attached to emotional eating & weight gain are guilt and shame. EFT – Emotional Freedom Technique / Tapping, can help people to shift these strong emotions, setting them free to enjoy food, enjoy life, be happy & move forward! Could powerful emotions such as guilt & shame be keeping people in stuck mode, causing them to put on weight rather than lose it? They may find that no matter how hard they try to adjust their diet, eat healthy, eat less, exercise more, the weight either stays as is or creeps up even further! People will have heard of the commonly used phrase “oh – I only have to look at food and I put on weight”. Well, there’s more truth to it than one would expect! Guilt and shame surrounding weight issues is widespread but probably not discussed as freely as it should. How many of us wish we were a size or 2 or 3 thinner than we are and feel bad inside because we’re not? Growing up, we are culturally conditioned to feel guilt or shame about being overweight or having extra weight or being unable to lose weight. We and others may automatically and subconsciously label ourselves or others as “being weak” or “having no self control” or “being obsessed with dieting”. Some of the most common emotions lacking in us humans are self-love, compassion and forgiveness. Much of this can stem from an upbringing where it was the norm to bury your emotions – “don’t cry”, “chin up”, “get over yourself”, or hearing others say “oh you’re full of yourself” or “who does she/he think he is?” What do we do – suppress our emotions, bury them deep and forget they ever exist. This can creep into our eating habits – suppressing our emotions through eating, snacking, binge eating, comfort eating, eating to get that high, and secretly eating. These all come under the heading of Emotional Eating. 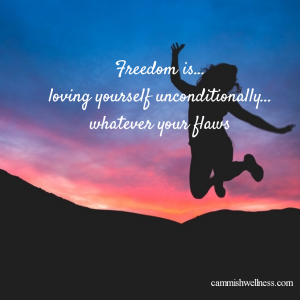 Loving ourselves may not come naturally to everyone…I know people who dislike themselves so much that they can’t even look at themselves in the mirror, or be naked in front of their partner, or get changed in front of others or shop for clothes in actual clothes shops (so they buy online or via catalogues). I know others who cover themselves up completely so that others won’t laugh at them – some people don’t go swimming, or wear shorts or short sleeved tops or skirts in the summer. To these people I say – it’s not your fault! Because it…is…not…your…fault. Throw away this blame game and start from within. Forgive yourself for thinking that it is your fault…it is no-one’s fault. Who are we to blame ourselves so much that we dislike our selves from the core? Who is really judging ourselves…only ourselves! Why should ‘what you think someone else will think or say about you’ affect you? Perhaps due to low self esteem, lack of confidence and a lack of respect for you being all beautiful from the inside out…no matter what you look like? You ARE beautiful from within…everyone is! Think of a baby or a young child…a being filled with love…happy, pure of heart, seeing only love. We all started out that way…events or others unfortunately may have altered our perception of love and joy and happiness. But – it is still inside every single one of us. All we have to do is acknowledge ourselves, show compassion, and love ourselves. How you ask? How do I do this after all these years? Simple my dear friend – one step at a time. 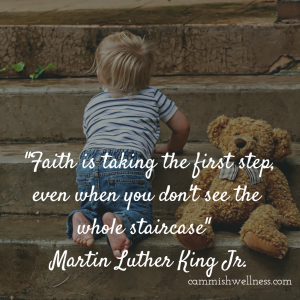 As the amazing Martin Luther King Jr. once said “You don’t have to see the whole staircase, you just have to take the first step”. What is a simple first step you ask? 1. Place both hands, one on top of the other on the centre of your chest. Take 3 long deep breaths in and out. Say the word “relax” on the exhale. This is called “Heart Centering”. 2. Eyeball yourself in a mirror – yes you can do it!!! Look deep into your eyes…yes, those beautiful eyes. Say to yourself “I see you, I acknowledge you…I accept you for who you are”. 3. If you’re ok with doing so – say “I love you, I really, really love you & I’m going to start looking after you now”. I understand that this may be extremely difficult for you to do. I get that. That’s why I’m here to help you take that first step. You can do it – you just have to give yourself permission to do it . I have had the pleasure of helping clients release strong emotions that are holding them back in life. Seeing them free and happy and sparkling is such a gift. I couldn’t ask for anymore in the work that I do. I love what I do. I would love to help you too. Let me show you how to “Set Yourself Free with EFT”. I see clients 1:1 in my private clinic in north Cork and also via Skype. Get in touch to see how I can help you take your first step. Emotional eating is a behavioural pattern that can be reversed & healed by using EFT – Emotional Freedom Technique or Tapping. Working with an EFT practitioner can help to identify the root cause of specific habits such as: succumbing to cravings, eating to avoid certain unpleasant feelings such as low self esteem, stress or guilt & a cycle of constant snacking and never feeling satisfied. Emotional eating – we all do it at some point in our lives…I’ll happily hold my hand up & say chocolate is my go to thing when I’m feeling down or unhappy or stressed. For some it’s ice-cream, or biscuits, or crisps or bars. It’s often seen as a treat or a reward when you feel something such as “I’ve had a hard day…I deserve this”. And that’s ok. Sometimes though, it can get out of hand & become a habit, which can be very difficult to break. This can build up over time, until at some point we don’t realise why we do it or indeed that we are doing it at all. Healing our relationship with food and most importantly with our body, is key to nurturing our emotional side that really needs healing. Emotional eating is a behavioural pattern that can be difficult to control. A pattern that may involve: eating to deal with stress, overeating to avoid our upsets, constantly snacking to get the sugar hit that makes us (temporarily) feel amazing….followed by feelings of guilt and over-indulgence, along with a blood sugar level that is constantly high or low…followed sometimes by weight gain and an inability to successfully loose weight long term. 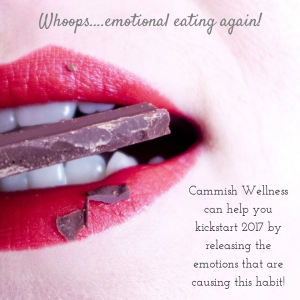 At Cammish Wellness, I use a combination of techniques to successfully help clients reduce cravings, break the habit of emotional eating and reduce & manage their stress levels. 1. I assess stress levels at each session & show the client some stress management techniques to lower their everyday stress. 2. I teach them EFT – Tapping, to use as an everyday tool to reduce cravings, stress, anxiety, anger, fears, guilt, pain and most importantly as a tool to help them free themselves emotionally. We address the root cause of their emotions, use EFT to free these emotions & replace the negative emotions with positive ones, so that they feel great & have a back up tool for when they don’t feel so good. 3. I use coaching techniques to help them make small achievable action steps (that are part of a bigger goal). We set up accountability whereby the client checks in between sessions to keep track of their progress. And I help them throughout the process to find their spark, their motivation and inner power. 4. I address any dietary advice as & when needed using my nutritional therapy knowledge. I have had great feedback from clients who are on a new healthier, happier path making long lasting changes to their lives. They have successfully reduced their stress levels, stopped their food cravings, dealt with deep emotional issues & are now happier, less stressed, motivated and are actually enjoying life without the guilt! Are you ready to make healthful life changes and free yourself emotionally in 2017? I would love to hear from you 🙂 & discuss how I can help you become the person you truly deserve to be! Parenting stress occurs when the demands of being a parent surpass the expected and actual resources available to the parents. Parenting can be stressful at times, in many different ways. It is a normal part of the parenting experience. It is our reaction to stress and how we cope with it that decides how it affects us and our kids. 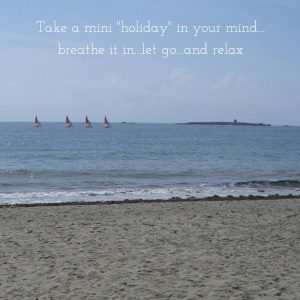 Take a mini “holiday” right now…to relax and let go of any unnecessary worry, tension or stress….increasing your energy and happiness. Not everyone can get away on a peaceful holiday…here is how we can make it happen energetically. Here is a simple but very effective stress relieving technique that you can do anytime you wish. Perhaps you have your own image or memory from a wonderful holiday that makes you feel all loved up, happy and warm. The pic below is from a holiday a few years back in France…it works for me…it doesn’t have to be a foreign sunny place…whatever memory is special to you will work again right now. 1. Place both of your hands over your heart (centre of your chest where you would point to yourself). 6. Can you sense how relaxed your are on this beach? 8. How do you feel inside right now? 9. What can you see? hear? feel? Enjoy every moment…make every second count…when you are ready…step back into your life relaxed, happy and energetic. Do this technique whenever you really feel like you need a break from life 🙂 Hope this helps!